The ability of the laparoscopic surgeon to reconstruct the genitourinary tract is fundamentally the same in the closed versus the open abdomen. The five techniques available for tissue reapproximation are listed in Table 2. More than one modality can be combined as in Dr. Avant's end-to-end anastomotic device and tissue laser welding techniques (36). The surgical literature is replete with arguments for and against suturing versus stapling for gastrointestinal reconstruction (37-40). Much research has been fostered into the mechanisms of tissue healing following various reconstruction techniques (38). Suffice it to say that the integrity of the intrinsic blood supply is paramount to the ability of mucosa-to-mucosa sealing (38). 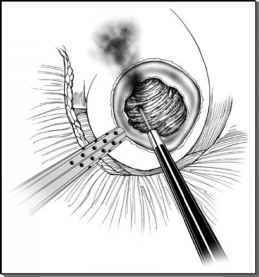 Anastomosis and complex enteric-uroepithelial composite appositions are the rule for urologic reconstruction. A number of synthetic, autograft, and xenograft materials have been sought to further diminish the trauma of urologic reconstruction (41). Methods to reapproximate these and native bowel segments to the bladder laparo-scopically are being investigated. Stapled and sutured bladder resections and closures have been described (42-45). Bladder diverticula have been removed and partial cystectomies with and without nephroureterectomy have been described (Fig. 42) (46-48). Both clinical study and animal work on the use of metallic autostapling instruments suggest that this technique is successful (49). Delayed complications, specifically incrustation on the foreign body nidus, have not been observed to date. This probably reflects the investigator's careful apposition methods, trying to keep the staple line from direct contact with the urine. Upper tract reconstructions have also been reported. Dismembered pyelo-plasties (49), anterior pyelocaliceal diverticulectomy (Fig. 40) with omental patch (50), and partial nephrectomies (51,52) have all been performed. The reconstructions to date have been hampered by constraints of limited instrument technology, lack of stereoscopic imaging, and closed, fixed, operative access to the urologic areas of interest, but the tide is changing. The numbers of diverse, sutured reconstructions have been increasingly reported as would be expected once mastery of this environment becomes coupled with technologies that facilitate rather than hinder progress.